Early in the week we dove into the top 100 American goalkeepers on the men’s side so to give some face time for the young guns coming up, here are the top eight goalkeepers from each birth year. Goalkeepers are ranked more on ceiling and potential and less about current form. Not every goalkeeper’s birth year is public so some of the goalkeepers may be placed up or down a year. The 2019 U20 World Cup kicks off in Poland next spring but the US's journey through qualification starts in two months, with the first game on November 1st. And thanks to a more expansive approach to the goalkeeping position, USYNTs have seen a variety of talented goalkeepers come through camps over the past few years. With qualification just around the corner, let's survey the ten likeliest goalkeepers we could see in the fold for the U20s. 1. Justin Garces (UCLA) - The U17 World Cup veteran leads the pack. Garces has been the number one choice for the US for the last two years and there are no signs of anything changing. After training with Atlanta United this summer, Garces is currently sitting behind sophomore goalkeeper Cole Martinez at UCLA. Playing second fiddle isn’t ideal for a starter going into World Cup qualifying but Garces isn’t one to let his skills get rusty just because he’s not a number one. For a goalkeeper who will likely not even finish his four years at UCLA, Garces will undoubtedly be ready to play this November. 2. 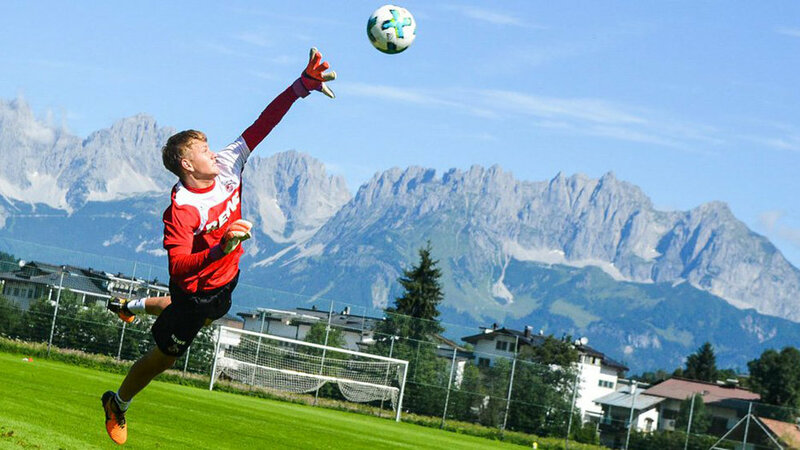 Brady Scott (FC Köln) - It’s been a while since an American goalkeeper has done well in Germany. Despite the lack of success, Brady Scott and Jonathan Klinsmann are holding their own in an intensely competitive setting. Over the last month and a half, Scott has earned four starts for FC Köln’s reserve side, allowing four goals in four games. It's hard to describe Scott’s “style” as it feels fairly undefined in a lot of ways (perhaps the result of Scott developing in two different goalkeeping environments). He isn’t particularly flashy, but he’s not slow. He’s not aggressive, but he’s not passive. He did well getting low on a few saves in his most recent game against SC Verl, but it’s also a part of his job to make those plays. At the end of the day, if he can be a consistent, stable force in net for the U20s, it'd be hard to ask for more from him. 3. Eric Lopez (Los Angeles Galaxy II) - Lopez’s stock has probably dropped a tad since this time last year. Lopez’s last two wins for LAGII came in September 2018 and August 2017. Admittedly, LAGII is a development side and not a team that strings together large win streaks. In spite of this, more should be expected from Lopez thus far. It isn’t easy when you’re in goal for one of the leakiest defenses but Lopez too frequently is caught overthinking a situation. If he can limit hesitations, sort out his feet in tight situations, and find a good run of form, he could not only contend for a roster spot but also the starting one as well. 4. Trey Muse (Indiana University) - After allowing only seven goals in 25 games last year - posting an unheard of 90.3% save percentage in his freshman year - Muse returns in goal after trailing in the Netherlands this summer. In the early stages of his sophomore year, Muse currently rides a three-game shutout streak as Indiana is the favorite in the Big Ten and on track to contend for another national title. If Muse can continue his success, #Q49 might quickly turn into #Q410. 5. CJ dos Santos (Benfica) - Dos Santos was one of the three goalkeepers for the last U17 World Cup roster but there’s a decent chance being overseas has removed him from the limelight of receiving a call-up for qualifying games. While Scott is earning first-team starts, dos Santos sits sandwiched between a number of Portuguese national team goalkeepers in Benfica’s youth ranks. So where dos Santos may not be earning as many headlines, he could very well take a similar route as Brad Friedel did, gradually grinding his way towards the top. 6. Brandon Austin (Tottenham) - The lanky goalkeeper relies heavily on his positioning and reactions, rarely daring to roam upfield. Time will tell how he completely develops but so far it’s been working, just recently having a positive showing in a 2-1 loss to Arsenal’s U23s. Perhaps the biggest question marks that come along with Austin’s game is with his dual citizenship. Austin was called into an English U19 camp back in April and the young goalkeeper’s eligibility to play for America is rumored to be in question. 7. Alex Budnik (Dartmouth) - Budnik has been a mainstay in USYNTs for the past few years, including making the 2017 U17 World Cup roster. Budnik hasn’t started for Dartmouth this season, but Dartmouth has conceded five goals in two games with two different goalkeepers. If the defensive woes continue, the freshman could easily see himself starting the Big Green and prove why he should be included on the U20 roster. 8. Quantrell Jones (UMBC) - Jones is one of, if not the, largest goalkeeper on the list. At 6’3” and 230 pounds, the DC United academy product is more of the traditional cut when it comes to classic USYNT goalkeepers. He's strong, with a solid frame, and quick reactions. While Jones has been in and out of camps with various USYNT, Jones is outside looking in with the U20s going forward. If Jones can crack the starting spot at UMBC, perhaps he’ll grab Ramos’ head, but until then we probably won’t hear from him again until he’s an upperclassman. 9. Johan Penaranda (Pittsburgh) - 2018 has been an eventful year for Penaranda. In February, he de-committed from the Naval Academy, announcing he’d be attending the University of Pittsburgh this fall. In the summer he won the U19 DA playoffs with NYCFC and followed up the trophy-finish with earning the starting spot for the Panthers. He hasn’t been exceptionally successful this early in but there’s still some time to wow Ramos into reminding him why he deserves another call-up. 10. Gabe Rosario (Huddersfield) - Admittedly Rosario’s tenure overseas hasn’t been stellar, notching just one point in five games and allowing 14 goals in the span for Reading’s U18 squad. But after watching what Rosario brings to the table, he holds his own when playing for one of the worst defenses in the league. He's quick and fights for the save, even if the scoreline is lopsided against his team. Rosario has since moved to Huddersfield where it looks like he’ll mostly play backup this season but the understated goalkeeper has an opportunity in front of him few goalkeepers his age even get a chance at. Lopez has quietly risen to prominence out west. While a number of his peers are in Europe, Lopez shows us that the US can still develop their own goalkeepers. Lopez, who turns 19 in March, has a good frame and moves well in the box. He's shown positive strides in his 1v1 approach and continues to fight for time in a highly competitive environment with LAG2. If Lopez continues to round out his game, he'll be fighting for playing time against Zack Steffen and Ethan Horvath soon enough. With the way dos Santos covers the goal frame, it's hard not to think of David de Gea. Dos Santos possesses a massive spring to propel himself like no other USYNT prospect. But unlike de Gea, dos Santos plays with such an aggressive mindset that he'll insert himself into almost any play that enters the box. It's a tough playstyle to master, one we haven't witnessed in the American scene since Kevin Hartman, but if dos Santos can find that perfect balance, he'll be a strong presence down the line. Last fall Ivory was with the University of Virginia and this spring she's with the U20s in their current World Cup Qualifying campaign. Ivory is akin to recently acquired Utah Royals goalkeeper, EJ Proctor (or Ethan Horvath for Ivory's male counterpart). Ivory stays close to her line, relying on her ability to read the game and react from the goal mouth. She doesn't get overwhelmed in unfamiliar scenarios and isn't afraid to challenge crosses in the box. While she's a little undersized for an ideal goalkeeper, she more than makes up for it with her balance, game knowledge, and self-confidence. When a sixteen-year-old is starting for a Premier League U18 team, it's a safe bet to say he's a pretty decent player. Defreitas-Hansen sits right around 6'0" and has a deceptively quick post-to-post time. Similar to Ivory, Defreitas-Hansen prefers to stand players up but does a great job of keeping his weight forward and his feet under him. Reportedly Defreitas-Hansen can also play for Brazil and Denmark but he's only represented the US thus far, making three appearances with the U16s. With most tall goalkeepers, they struggle to move from side-to-side and to quickly drop to the ground. Fortunately for the University of Michigan, Beall has shown the agility to take her game past college. The 5'11" goalkeeper can move in the box and has strong hands to complement her play. Beall made seven starts her freshmen year and is poised to take over as the starter for the Wolverines in 2018. Back in 2015, Everybody Soccer predicted the 2018 depth chart for American goalkeeping. For predictions three years out, they did about as well as you would expect. Reviewing the predictions, there were some significant errors. Predicting an aging goalkeeper's descent is anyone's best guess. Josh Wicks and Jon Busch were great examples of more goalkeepers who proved they had more gas in the tank than expected. Nick Rimando was also much too low on the list. As for young goalkeepers, they were largely underrated. Steffen and Horvath were far too low and are already in the national team picture while Kempin, McMath and Meara were too high. Overall, most of the names were in the right room, but it was the order that was the issue. For the 2022 projections, the first hurdle is drawing a line on who will and won't be retired. Goalkeepers can certainly have longer careers, but currently MLS only has three goalkeepers over 35 years old. It's unlikely many will play that long but Brad Guzan and Tim Melia have the inside track at the moment. Hopefully Stefan Frei (36 by the 2022 World Cup), Steve Clark (36), and Bobby Shuttleworth (35) will all still be playing but it'll require a strong commitment from them to stay in the game. And of course there will likely be a young hotshot who is 15 or 16 right now, but will be training with a top club by the time they turn 20 or 21. Perhaps Nicolas Defreitas-Hansen at Everton or Quantrell Jones? Many people are claiming the goalkeeper position for the USMNT is absent of any meaningful competition heading towards 2022. On the contrary, there are a number of outstanding prospects that are on pace to challenge for the number one spot. It could conceivably be the tightest goalkeeping competition the USMNT has ever witnessed with no clear standout but a number of quality goalkeepers vying for minutes. Understanding that five years is a long time and anything can happen between now and then, here are 100 American goalkeepers to keep an eye out over the next five years. Bill says: Of any American goalkeeper, Horvath is easily playing at the highest level and the dividends are sure to pay off. Romero will likely end up getting cap-tied with Mexico, but for the moment he's still available for the USMNT, barring a one-time switch to play for the US. Caldwell, Lundgaard, Marcinkowski, and Pulisic lead a very strong collegiate group and are already ready to report to duty. Bill says: With all the instability in LA and DC, Kempin and Klenofsky are in great positions to take over their respective MLS sides in the next year or two. It sounds like Bill Hamid isn't re-signing with DC United and is headed towards Europe for 2018. Unfortunately he'll be on the wrong side of 30 by the time the next cycle comes around. Of course any goalkeeper can play at 31, but it's a little more of an uphill climb, especially for a goalkeeper who has struggled to stay healthy. Brendan Moore has yet to be a part of a winning team overseas but he's always been a commanding force in the box and it's why he's finding work in England. Bill says: It'll be an odd world where Zac MacMath isn't a young goalkeeper in MLS but 2022 will be just that. Alex Bono bounced back from a mediocre 2016 for a strong showing this year, getting the bulk of starting time in Toronto FC's historic run. With rumors that David Ousted isn't returning to Vancouver next year, Richey will throw his name into the hat for the starting spot in 2018. Lyon's lateral mobility makes him an interesting prospect moving forward and Richard Sanchez resurfaced in MLS this season, already owning a win under his belt. Bill says: The once heralded Ryan Meara could easily lose favor to up-and-coming goalkeeper Evan Louro, who skipped his last year at Michigan to pursue a career with RBNY. Blanchette has quietly earned 18 starts for third place PEPO. While Morton and Dal Santo are a little off the radar at the moment, they both possess the size and speed to excel at the next level, even if they don't hear their names called next SuperDraft. Kevin Silva is finishing his sophomore season with UCLA but don't expect him to stay all four years. He has the talent and prestige to follow in Louro's footsteps. And perhaps in 2022, FIFA will bump up Bersano's speed rating. Bill says: While the NASL may not be around by 2022, Spangenberg should be able to build off his strong performances with Puerto Rico to continue to compete for a starting spot somewhere. Similarly, Sylvestre has made positive strides with North Carolina FC and has past experiences in MLS that he may be able to build off of. Tarbell has played ten straight games for San Jose and is the frontrunner to start the 2018 season for the Earthquakes. With Deric's game built so much on his explosive reactions, it'll be interesting to see how he fares in his later years. Bill says: Vom Steeg has recently returned to California from playing abroad and LAG2 put him in goal quick, already earning four starts in the last month. Klinsmann is doing well to already be making inroads with Hertha Berlin. Rogers is taking an unconventional route by playing in Mongolia but he looks like he's getting his money's worth in the Eastern Hemisphere. Gomez has recently become a back-to-back USL Golden Glove winner. Bill says: Admittedly dos Santos is a bit of an surprise pick as he's currently the backup to the U17s. However it's hard not to see shades of David de Gea when you see the young Philadelphian move in goal. Dobrowolski played only two games in 2016 but did well to concede just 11 goals in his 12 appearances with Louisville this year. Garner continues to build off of last year's Goalkeeper of the Year performance in his conference, currently holding a .91 GAA. Young Galaxy goalkeeper Bennett Sneddon has room to grow but the twenty year old is developing well against USL competition. Bill says: Hale had a wonderful start to the season, being named TopDrawerSoccer's national player of the week back in early September. Shepherd assisted the Michigan Bucks' US Open Cup run this spring, topping Indy Eleven to reach the third round. Mason Stajduhar is still searching for his first professional cap but he already has good experience with the U20s. Willis and Lampson will probably hold backup roles by 2022 but their consistency will be the main reason why they'll likely still be playing into their 30s. Bill says: Many people want Yarbrough to re-enter the USMNT goalkeeping scene, as he's currently sitting top five in saves and clean sheets in the Liga MX's spring season. Unfortunately he'll on the wrong side of 30 by the World Cup. Partee has an option of signing as a Timbers homegrown after this fall. Romig has split time with freshman Alec Smir and junior James Pyle, making the goalkeeper situation in Chapel Hill easily the most competitive in the country. Bill says: Attinella and Rowe enter 2018 nearing, or at, their peak but they only combine for just 100 MLS appearances in their 13 seasons as a professional. (Attinella also has 52 appearances in NASL action.) Continued development is hard to come by for any goalkeeper this late into their career. Barraza has a possibility of an homegrown contract with Real Salt Lake, if the decide to go that direction with the Marquette goalkeeper. Jon Busch should be nearing 700 games played by 2022.